Since then, we completely reconfigured the floor plan, demolished walls and put up new ones. We then re-wired the electrical, installed hardwood flooring and hung new light fixtures. Then came the paint – or rather, two rounds of two coats of paint, because someone couldn’t decide on the perfect shade of gray – that someone, of course, being me. Sadly – and I know you’re getting tired of hearing this phrase – the entryway is nowhere near finished. It will continue to evolve over the next few months, I hope. After all, the entryway is your only chance to make the right first impression on anyone who walks in. I waxed poetic on that idea in an earlier post, when we first installed the lighting, if you’re curious. I’d like to think we have far more personality to share than what you currently see in the space. The front door is yet to be painted…(should I go with dark charcoal or black?) 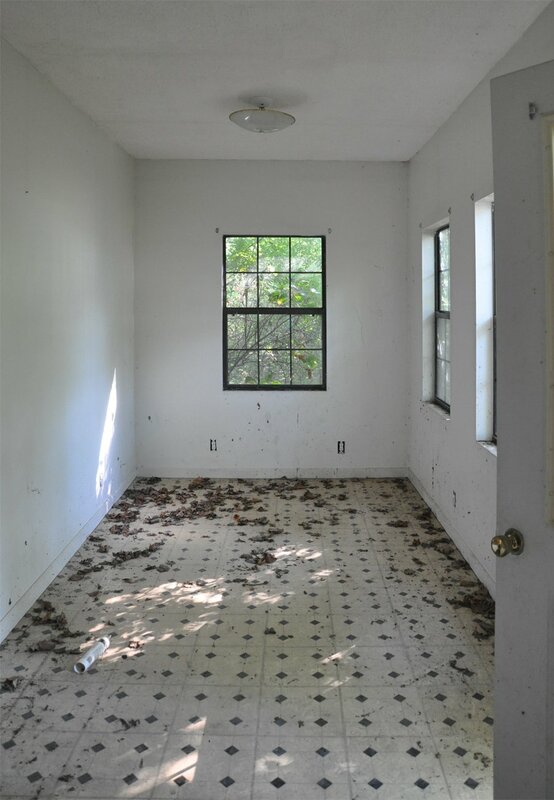 a lonely, empty wall to cover with art or mirrors or 3-D panels…(or maybe wallpaper?) storage solutions to dream up and space to maximize… You get the point. But today I wanted to show you what’s actually finished – as well as offer a couple of tips of why certain pieces work in this space. 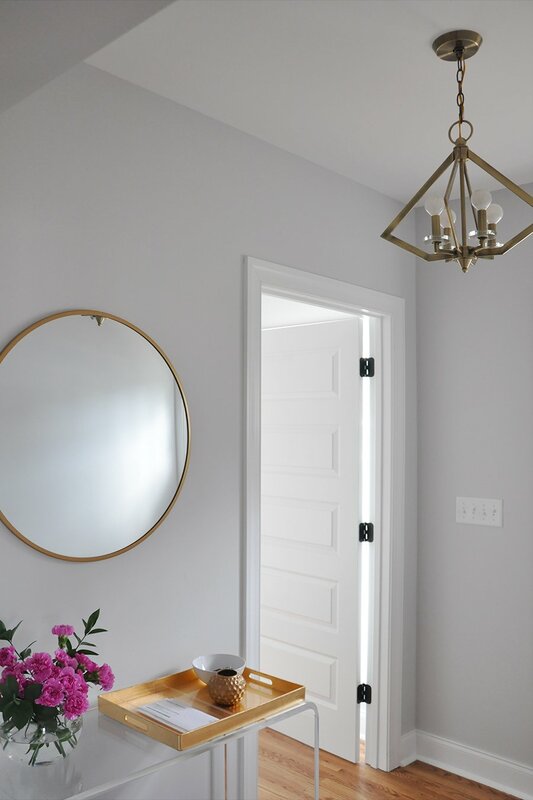 Hopefully this post’ll inspire you to evaluate the functionality vs. personality of your own entryway and see where you can improve. It all started with a rattan chest that I thought might look good in the entryway. The chest was far too bulky and visually overwhelming for such a small space, so I decided that the mudroom/office nook would be our dressing area that would house coats, shoes, etc. 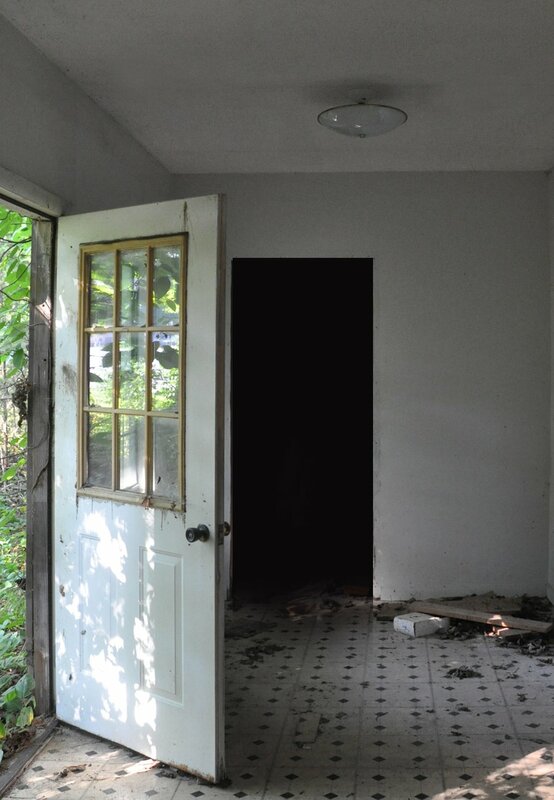 The entryway, on the other hand, would be more of a greeting area for visitors. Instead, I chose a lucite console table from Safavieh. It takes up very little visual room, making it perfect for smaller spaces. Yet there’s plenty of table space to hold odds and ends. 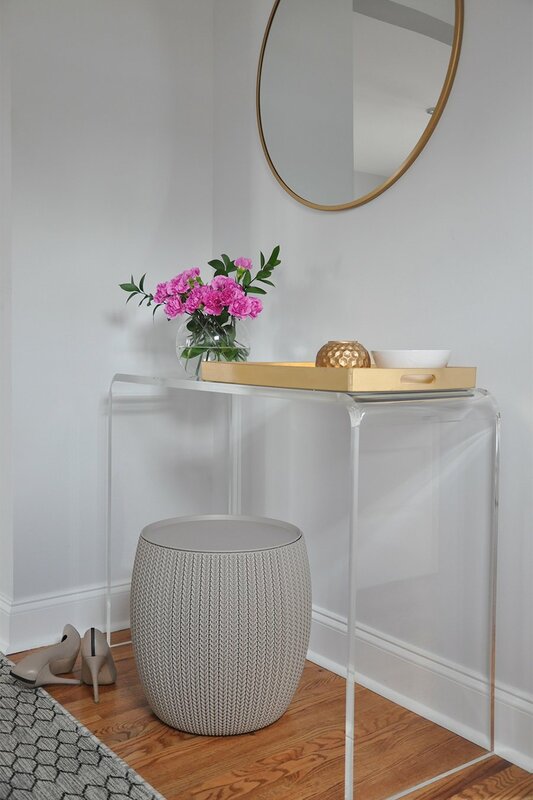 Mirrors are a great way to reflect light and make a space feel bigger and more open. 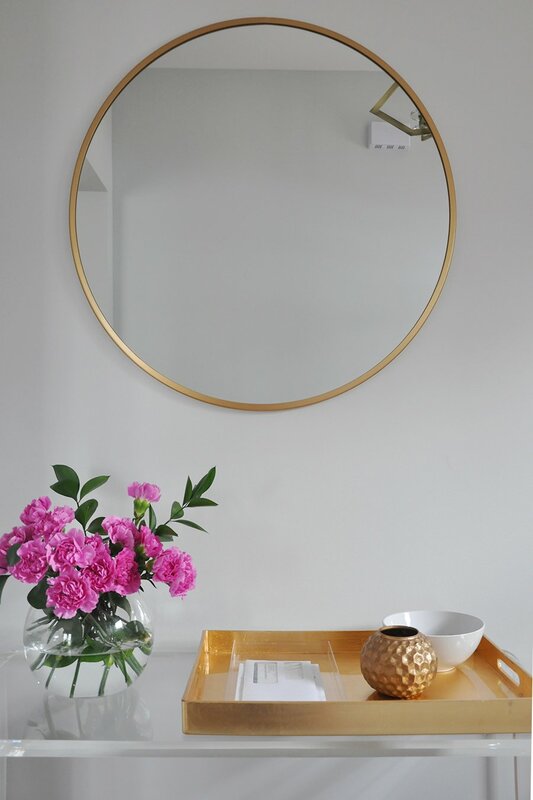 Remember my collection of brass, round mirrors from Target? I’m happy to report that another one has found a permanent home – in the entryway. Sure, you may notice its twin hanging on the fireplace, but there’s no such thing as too many round, brass mirrors in my book! The round shape adds a nice balance to otherwise straight lines, and the brass of the frame goes well with the brass of the chandelier. A dark, patterned indoor/outdoor rug is another must-have for the entryway. It fulfills multiple purposes; first, it’s a place to wipe off our shoes, as one does in an entryway. Second, a rug can be a great way to add personality to the space. The indoor/outdoor, patterned aspect is an excellent idea for a high-traffic area. 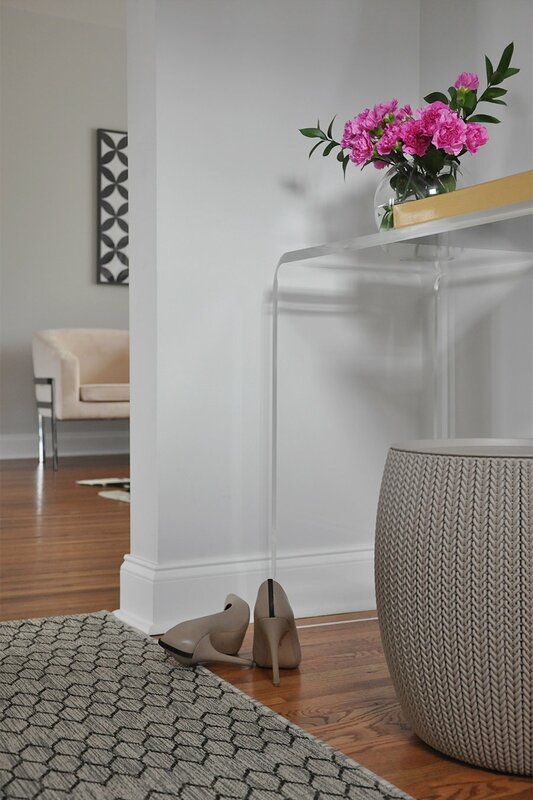 A small basket underneath the console can be a sneaky way of hiding clutter. I love this faux-knit, plastic option from The Container Store. It doubles as a stool for anyone who needs to sit to put on shoes. And when I say “anyone,” I really mean me and my growing belly. 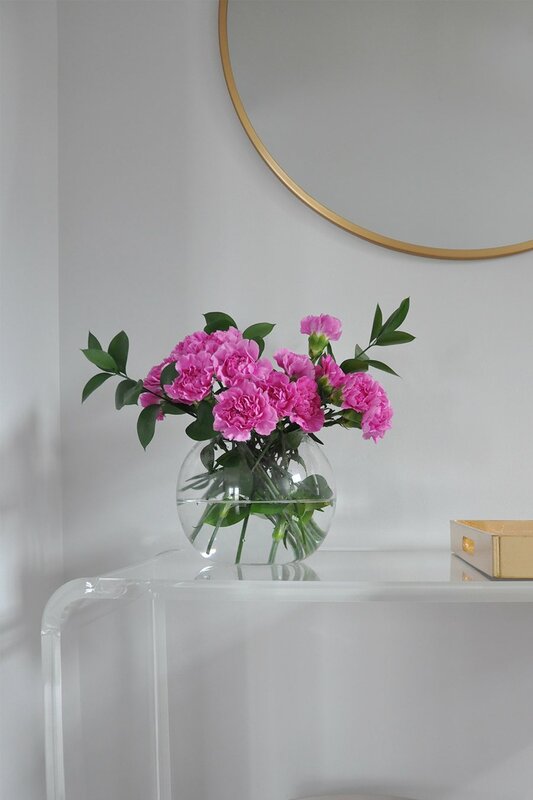 Atop the lucite console table, I like to add fresh flowers – a cheery sight for anyone who walks in and the perfect way to add color to the space. 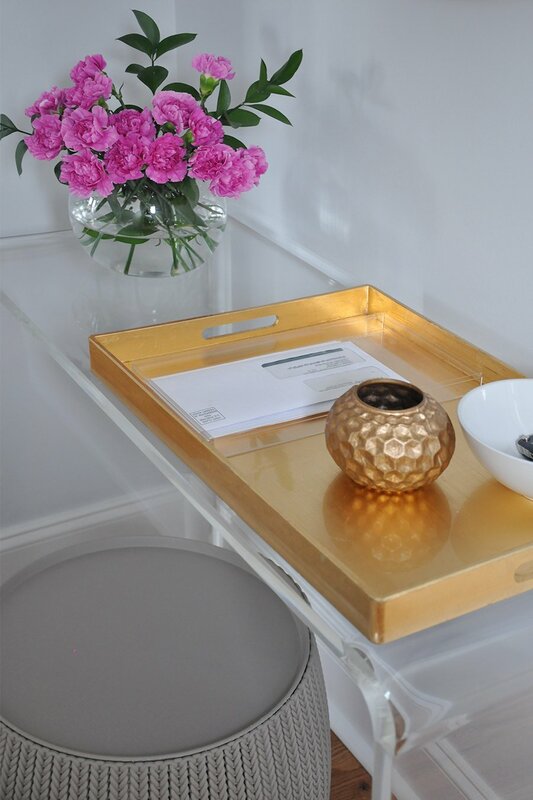 A letter holder is quite useful, too, as it’s a dedicated landing space for mail. 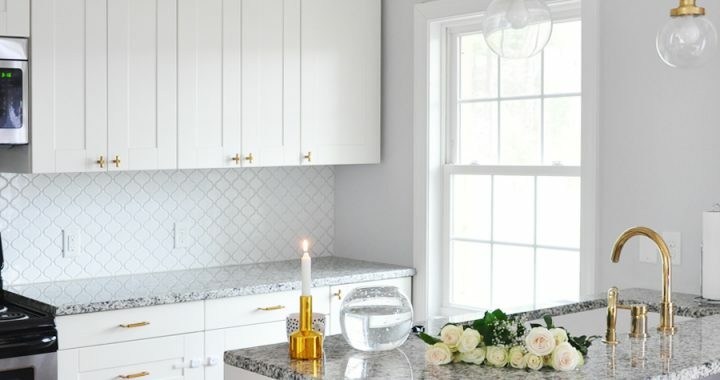 Last but not least, a decorative bowl or pretty votive holder are convenient for holding keys, loose change and other knickknacks that would otherwise end up a mess atop the kitchen counters. And, of course, can’t forget a large, gold tray to instantly ground all the random objects together. Now, it’s your turn! What do you like to keep in the entryway, and what do you prefer to hide elsewhere? Any tips and tricks for combining functionality and personality in this small space? 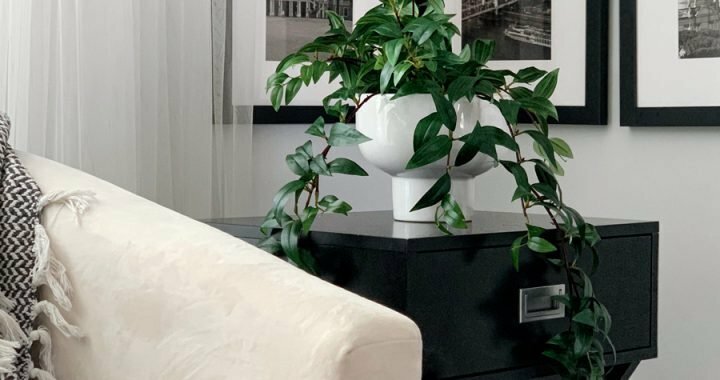 This post is brought to you in collaboration with Safavieh, who very generously gifted us the “Atka” acrylic console table. Thanks so much for supporting the companies that allow me to create unique content while featuring products I truly love. 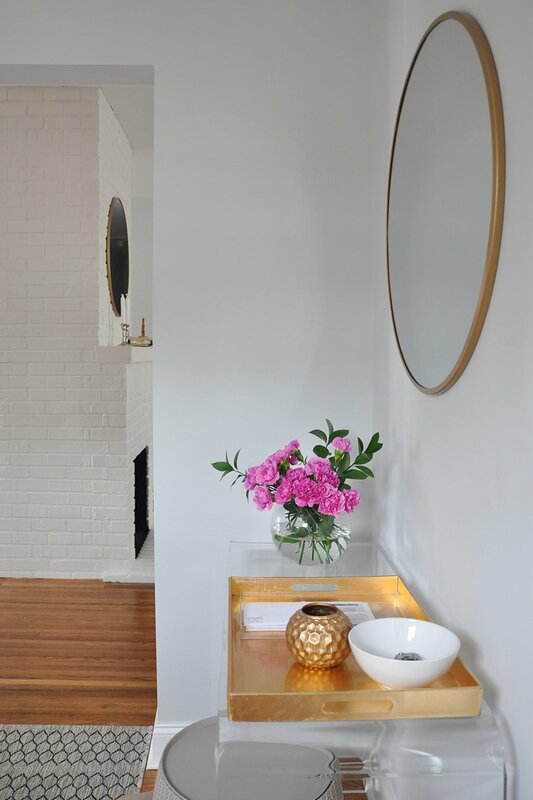 Posted in HOME DECOR, OUR BUNGALOW RENOVATION and tagged ENTRYWAY, INTERIOR STYLING. This is so pretty. Where is the rug from? Your home is so gorgeous, Oksana! I fall a little more in love with it every time you do a room reveal. I totally understand your desire to wait things out on the entryway. I slowly decorated my apartment because I wanted to get a feel for the space first. 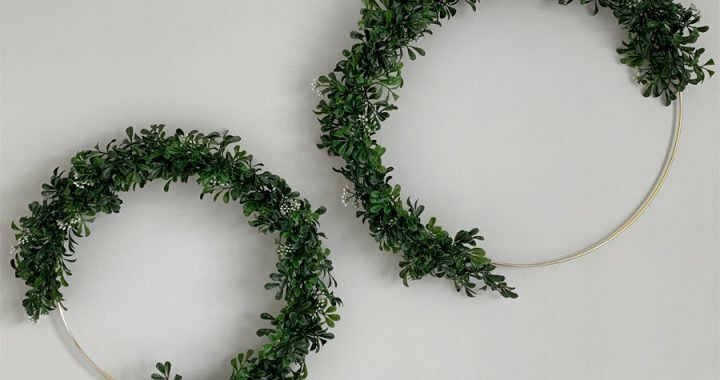 Looking forward to seeing how your entryway turns out! I have no doubt that it will be gorgeous. Please come style my home– you have amazing taste! I am absolutely loving the mirror- very chic. Love it! 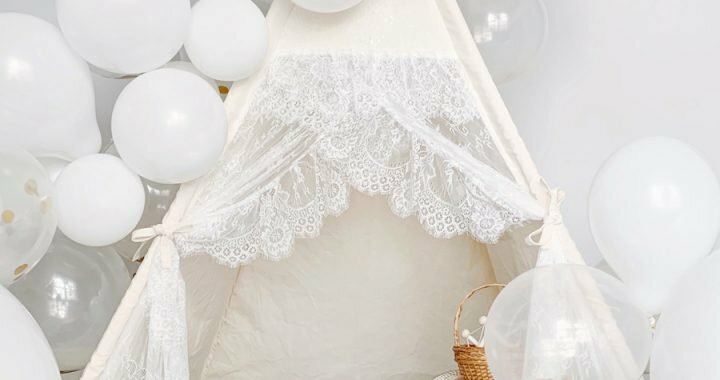 Your house is SO charming – and all the more impressive that you guys have been able to do so much with that old rundown home you bought before! 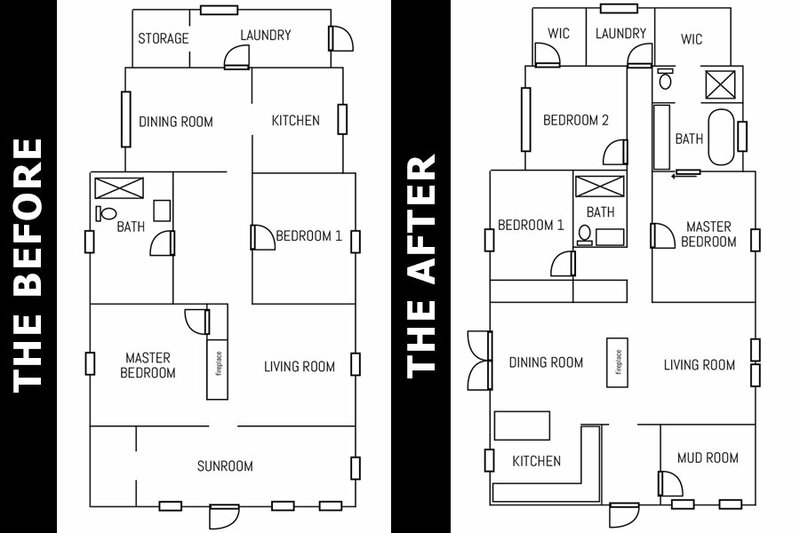 Thanks for sharing the floorplan changes – I really found that fascinating to look at!! WOW! I still can’t believe the transformation you’ve made with your house. It’s beautiful! I need you to come decorate my house! You turn every room into gold! I love your gold mirror so much! Your house is coming along beautifully! Love this! Such a great design – practical without taking up visual space. I love it!! Such a dreamy space, and that mirror is stunning!